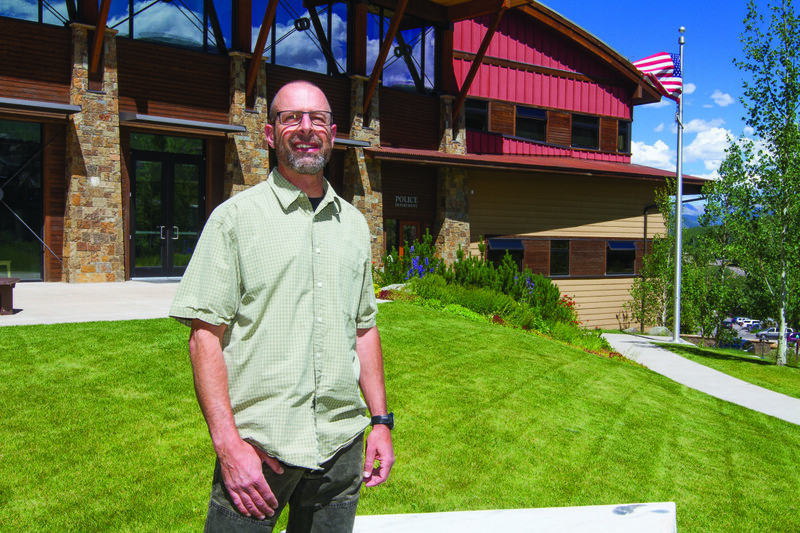 Brian Olson, Snowmass Village Chief of Police, outside of the Snowmass Village Town Hall. SNOWMASS VILLAGE – In his first interview as the new police chief of Snowmass Village, Brian Olson absolutely, positively didn’t want to pull a “Judge Smails” move. Recalling the scene from “Caddyshack,” where Ted Knight’s excitable character, perched behind a giant oak desk, can’t see the subject of his wrath, Olson talked about life as Snowmass’ top cop from an informal, round-table setting. That’s how the Waukesha, Wis. native and 27-year-veteran of the Snowmass Village Police Department likes to roll. Olson’s ascension to the head of the 13-person staff follows Art Smythe’s retirement after more than 30 years of respected command. He’ll oversee a $1.6 million annual budget and a village that’s grown to 2,826 residents, according to the 2010 U.S. Census. 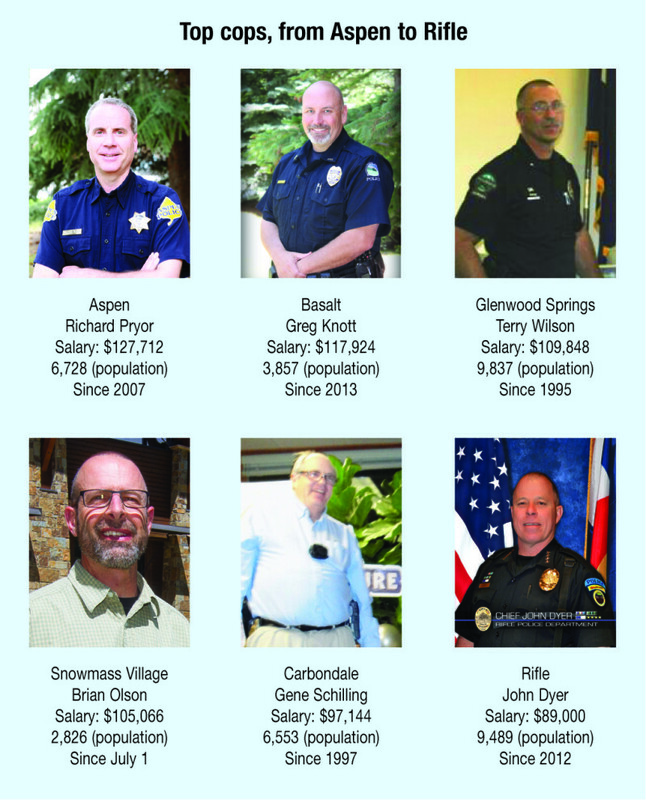 Seven of the nine police officers live within the community. and tourist drama. Working cooperatively with other agencies in the valley, the force has, nonetheless, been spared the violent crimes that touched its neighbors during 2014. One part park ranger, another highly trained firearms and defensive tactician, a day in the life of the police department is rarely dull, even in this bucolic small town. From his unassuming round table, Olson talked to Aspen Journalism about life on the beat. AJ: What has been your toughest day on the force? Olson: There was one murder/suicide in 2005 and a multi-day stand-off on McLain Flats Road. Those were difficult times. But there’s never been a time when I walked away and said I never wanted to not come back. This job has been extremely rewarding. Even when I’m on vacation, I can’t wait to come back to work. It’s never, ever been a drag. AJ: Even after the suicides or unattended deaths? Doesn’t that put an undue strain on your department because you usually know the person involved? Olson: Dealing with suicides is not easy. We understand the dynamics of it, having dealt with it enough. Sometimes you have to put up a bit of a barrier. Some of these people, like [23-year-old] Raymond Viera, we do know. Some we have personal relationships with. I’ve never seen anyone on staff waiver. Our sense of humor probably helps ease the burden a little bit. We use humor to manage a lot of issues. When you see a suicide or a dead body, you wear that for a month. One day you wake up and that view’s gone. You don’t fight that, it just is. The mind manages as it sees fit. AJ: What do Snowmass police deal with that other cop shops don’t? Olson: I liken our job more to that of a park ranger, when I explain what we do differently from a metro cop. We’re all trained, throughout the valley, and ready for that tactical option. But we do a huge amount of customer service. Our tourist base requires a lot of hands-on to get them where they need to go and make their vacation that much better. We’re the people at the forefront answering their questions. Olson: We have night shifts that can be pretty challenging. When our guys are out until five in the morning, the lack of sleep can create some issues. We run together, and had a team of four cops and four firefighters in the June “Ragnar” event. In the winter, we’re constantly hiking up the hill after work and we rarely talk about work on the way up. That kind of interaction is hugely de-stressing. AJ: Police brutality has been in the news lately. Any thoughts on that? Olson: We refer to it as “use of force” and are governed by the state law criminal code, which speaks to how we can apply it. (Olson said his philosophy is shaped by Sir Robert Peel). If we have the cooperation of the community, we don’t have to be inserting ourselves in a forceful way. That’s the root of community policing. That keeps us in tune with where Snowmass is. We don’t have to create forums to find out what the public wants. We’re out there on boards, skiing, having dinner at Il Poggio. It gives us a real connection to the community which really is our success in Snowmass. AJ: How does a small department police big music festivals like JAS Labor Day? Olson: We put in a lot of work right from the onset to help design the events. Years ago we worked with Joe Lang of Jazz Aspen Snowmass to develop a plan of better lighting for egress, security issues, a better operating event that made our job easier and ultimately made for a better guest experience. For the Thursday night concerts on Fanny Hill, not allowing BYOB has hands-down made it better. It was uncontrolled and difficult before and we had to make a change. AJ: Snowmass has always had a laissez-faire attitude towards marijuana. Has anything changed since it was legalized? Olson: We haven’t had to change much philosophically. Now we are finding ourselves having to educate more. People are under the assumption that it’s OK to do it anywhere. It’s not OK. You can be holding, but you still can’t light up in any area that’s open to the public. And we take marijuana seriously when it comes to driving. We do have to deal with underage kids and school kids. If the parent says there’s a problem, we try to create some influence on the kid. Editor’s note: Aspen Journalism and the Aspen Daily News are collaborating on coverage of Snowmass Village and other local governments. The Daily News published this story on Tuesday, July 29, 2014. Follow reporter Madeleine Osberger on Twitter at Madski99.